I went 3-1 this weekend in the NFL playoffs. I was one point off in my Baltimore pick. Tennessee did miss a field goal, but they turned shot themselves in the foot with all of those turnovers deep in Baltimore territory. A couple of 4 th quarter scores when the game was 28-10 pushed San Diego’s score up, but Pittsburgh dominated like I thought they would. I felt Arizona could put some points on the board and would need to against Carolina, but Jake Delhomme was destroyed by the Cardinals defense. This could be the start of something special. I can’t say I’m surprised by Philly’s win, they’ve proven they can beat the Giants in the Meadowlands. I guess I just bought into the Eli Manning hype a little too much. Now onto my AFC and NFC championship picks. Just looking at first glance. Pittsburgh has only won both games by a combined seven points over Baltimore, but if Kerry Collins can move the ball against that Ravens defense, with Big Ben showing no ill-affects from that concussion, the Steelers will be ready for this one. The Ravens and their rookie quarterback Joe Flacco barely escaped this weekend, but they need Flacco to do more than just manage a game. Pittsburgh 24-13. Do you think Arizona will sell out this game or will they need the pool guy to buy up the last few thousand tickets? Don’t look too much into the 48-20 Thanksgiving thrashing that Donovan McNabb, Brian Westbrook, and the Eagles gave the Cardinals back in November. The Eagles were coming off that loss where McNabb was benched the week before. While this game may have been the turning point in Philly’s season, I expect Arizona to be ready this time. 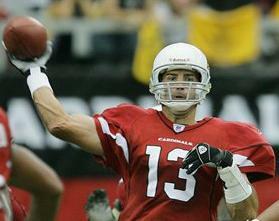 It will be played in the temperature controlled University of Phoenix Stadium and that will be an advantage for Kurt Warner. The Arizona defense is playing better. I like the underdog in this game. Arizona 20-17. What I said last week.